Hanhart proudly presents its latest model – the PRIMUS BLACK OPS PILOT! Hanhart’s brand new limited edition watch is the ultimate tool watch for modern individuals, who are looking for a chronograph for any occasion. The PRIMUS Black Ops Pilot is limited to a quantity of 82 pieces, referring to Hanhart’s foundation year 1882. It presents itself as a robust and masculine timepiece in the colours of the night and the Black Forest – the home of Hanhart. The tradition of more than 130 years in combination with progressive design and technology are merged with sportiness and maximum comfort, an ideal condition for outdoor operations and any kind of rough activities during day and night time. This automatic watch is designed for outdoor enthusiasts, but is also made for the individualist, who wants to make a statement. Wearing the PRIMUS Black Ops Pilot conveys the feeling of being focused, tough and decisive. As for the whole Hanhart collection, the watchmakers put a high value on functionality, quality and contemporary aesthetics in this chronograph. 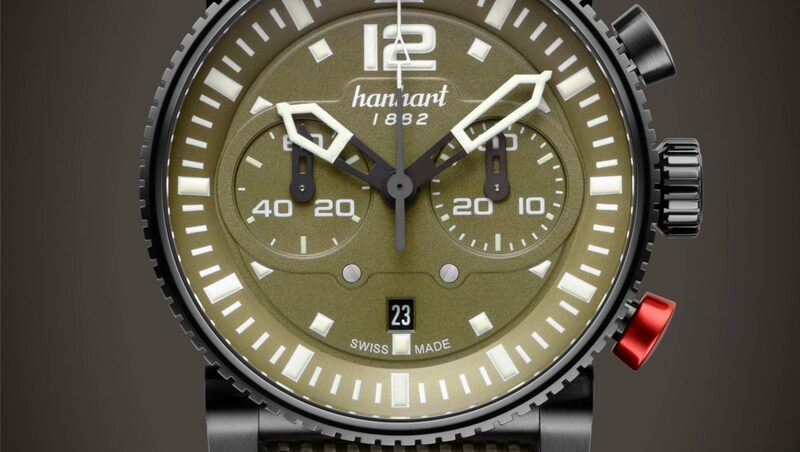 The dark design of a black DLC (diamond-like carbon) coated stainless steel case, the bronze green dial with luminous numerals and index marks as well as the dark green textile strap were contemporary chosen, without neglecting the striking Hanhart details: the distinctive fluted bezel with the eye-catching red marking, the typical “bi-compax” display arrangement and not least the anodized aluminum red button. All of these features embody a dynamic and uncompromising rugged look. However its timeless casual and ensures a maximum comfort on the wrist thanks to its flexible lugs and the durable fabric strap. More info and pre-order here!